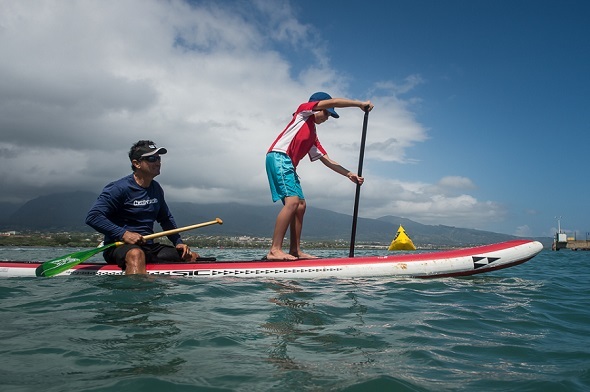 Kids have some help learning to SUP in Hawaii. 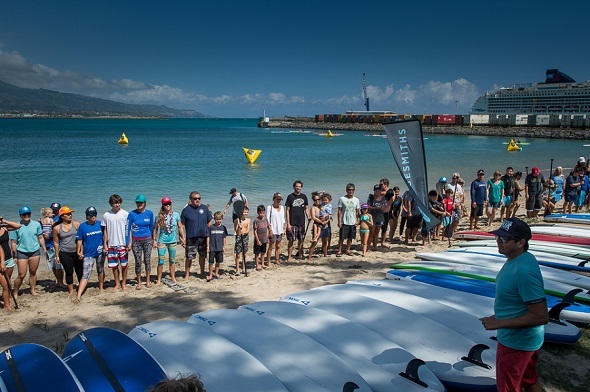 SIC Global Team Athlete Andrea Moller hosted the 4th annual Imua Keiki o ke Kai event, presented by Paddle Imua & Bluesmiths. The event was held on Sunday, April 3, at the Hawaiian Canoe Club in Kahului, Maui, to provide children with special needs an opportunity to participate in ocean sports with a who’s who list of pro water sports athletes. The keiki attending had a chance to enjoy stand up paddling, double-hulled outrigger canoe paddling and Jet Ski rides. Imua Keiki o ke Kai was originally inspired by Moller’s vision to offer the children of Camp Imua an opportunity to interact one-on-one with ocean athletes in a safe and supervised environment. The Imua Keiki o ke Kai has grown over the past four years since its inaugural event in 2013. It started small with about ten children and twenty volunteers. Most of the volunteers that day were Moller’s friends who dedicated their time and resources. The volunteers all arrived on the beach early, each bringing their personal boards to take a child paddling. The Hawaiian Canoe Club lent their double hulled canoe and the rest was history. About Imua Family Services: Since 1947, the nonprofit agency has been providing services to Maui’s keiki with special needs, concerns and developmental delays. Imua Family Services empowers families and their children to reach their full potential. To learn more about Imua Family Services, visit www.imuafamilyservices.org or call 808-244-7467. About SIC Maui: SIC is the stand up paddling industry’s premier manufacturer of high quality, race proven stand up paddleboards and accessories. Founded on the island of Maui and cultivated on a legacy of world class open ocean racing, SIC is an authentic stand up paddleboard maker proud to lay claim to a heritage of designing the most winning board shapes together with our team of elite athletes, brand ambassadors and customers around the globe. Five Star Performance is our motto and we wear it with pride each day through our commitment to extending the SIC experience on and off the water to our growing family.